Your thoughts about shopping malls are being reshaped with Starcity Outlet! Starcity, which has been transferred to Gençoğlu Group as of July 2016 and being managed by the experienced team of JLL Turkey, continues to attract high interest by many local & foreign tourists and visitors throughout a year thanks to its close location to Ataturk Airport and CNR Fair Center, the world brands contained and outlet prices. There is much to be discovered in Starcity! Starcity is a place where your shopping and entertainment dreams will come true! The world brands await you with very cheap prices and constantly renewed opportunities throughout the year. 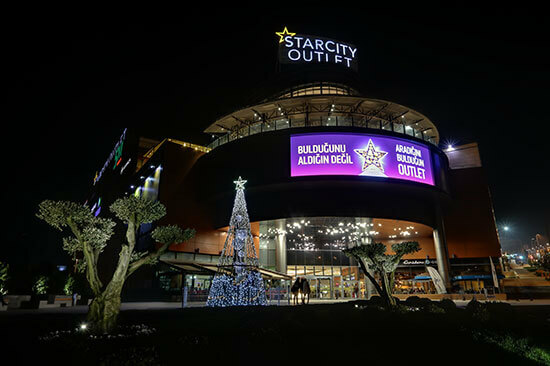 Starcity Outlet is a favorite for visitors thanks to the prices and hundreds of major world brands such as 5M Migros, Ebebek, Bellona, Tekzen, Beymen Outlet, Boyner Outlet, Network, Derimod, Columbia, Vepa Outlet, Adidas Outlet, Tommy Hilfiger, Hummel, Madame Coco, Tefal as well as the largest Puma Outlet and Karaca Outlet shops in Turkey. A wide variety of discounts and opportunities, distinguished delights from Turkish and World cuisines and enjoyable hours full of entertainment areas await you at Starcity Outlet for 365 days. Indoor parking lot for 1321 vehicles, outdoor parking lot for 650 vehicles. Gençoğlu family believes that honesty is the basis of their developments and sustainable growth in their trade life which has been progressed for more than forty years. They created Mioro which is one of the export leaders in the sector by taking industrialization steps about thirty five years ago along the way they set off with jewelry business. They saw the importance of branding in the retail field and continued their progress with Jival. They keep on growing with various hotel and Shopping Mall investments made in the real estate sector. They continue to progress with careful and sure steps, and always aware of the importance of being open to innovations.